How Can I Repurpose My Webinar After It Ends? Why Have A Conference Call Or Online Meeting If People Are Not Paying Attention? Should You Offer Your Employees Flexible Summer Hours? Webinar Best Practices. Learn from the Pro. New to streaming? Learn how it works. 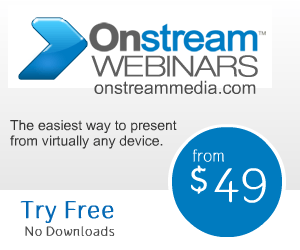 How to maximize the ROI on your lead generation and marketing webinars. Help Provide Your Insight On Continuing Education! Why Should You Consider Continuing Education? Make Your Follow-Ups Quick & Easy! Enjoy a #virtualcoffeebreak with a Dunkin Donuts Gift Card! What You Need to Ask About Web Conferencing? Infinite Conferencing - Best Web Tool for 2012! Why Conduct An Operator Assisted Call? Is Your Conferencing Provider Cutting It?